This is the million dollar question in Judaism and everyone seems to have an opinion and weighs in on the answer. I will not dilly dally or give out a long drawn out explanation, I will try to be short and sweet and to the point; because in reality the answer to this question is actually not that complicated. When you say someone is a Jew, or ask if someone is a Jew you can mean one of two different things. 1. One is a Jew ethnically because one or both of their parents were ethnically Jewish. 2. One is a Jew because they have converted to and practice the Jewish religion. In the times of the Tanak a Jew was considered someone whose father was Jewish; note that Patriarchs were Jewish and not the Matriarchs. The linage of a Cohen (Levitical Priest), and also what scientists refer to as the Cohen gene is passed down through the father. However, because of the persecution of the Jews through the various world wide pogroms, the Inquisition, the Holocaust etc., many Jewish women were raped and impregnated by Goyim and so a myriad of children who were born to Jewish mothers but had Goyish fathers and unless you were adopted, you know who your mother is, but you don’t always know who your father is. As a result a paradigm shift was made in Judaism and declared that you are Jewish via your mother’s side for reasons I just stated above. I accept both methods. I say if either of your parents are Jewish, then you are Jewish. There are, I believe people who are walking the earth who are Jewish/Hebrews and don’t even know it on account of the Diaspora of the lost ten tribes who were scattered and never returned to Israel through the Assyrian Captivity. For the people we recognize as Jews today are the ones from Judah and Levi who returned to the Land from the Babylonian Captivity. “According to Eliezer Shulman in his book “The Sequence of Events in the Old Testament”, Avraham was born in the year 1948 from creation (aprox. 2050 BCE). His son of promise Yitzchak, (Isaac) was born one hundred years later in 2048 from creation (aprox. 1950 BCE). This places the birth of Yitzchak some 3950 years from the present time. Using 25 years as a generation means that today we are 158 generations removed from Avraham. Using 40 years per generation, still removes us nearly 100 generations. The number of ancestors for any single person increases exponentially with each generation (two parents, four grandparents, eight great grandparents, etc.). Going back only 40 generations yields a potential of over one trillion direct ancestors for a single individual. This number far exceeds the total number of people who ever lived on earth since the beginning of time. With such immense numbers involved, it should be no surprise that we are all more closely related than might have been imagined. 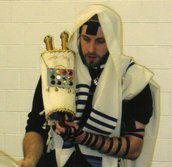 I also believe if one converts to Judaism, it doesn’t matter who or what their parents may be they have become Jewish by entering the Covenant of Abraham. This is what I believe what Rav Sha’ul said is a “Spiritual Jew”, one who is a Jew inwardly and has accepted the religious Jewish way of life upon themselves through conversion (Rom. 2:25-29). Here Rav Sha’ul is making a distinction between an ethnic Jew and a religious Jew. Mystics say that these people who convert have been drawn to Judaism because they are Jewish in the first place. It is said that G-d has put a Spark of the Divine, Himself within every Jew and no matter how far away from Judaism they go, that they will eventually return, because the Spark within them desires to be reunited with it’s source which is God Himself.